Welcome to Galway, the new “gateway” to St. John’s and a community in the most authentic sense of the word – a place where you can live, work and play. Boasting extraordinary views from its perch high above the city, Galway is strategically located in the heart of the Avalon Peninsula’s most thriving towns; and just moments from vibrant downtown St. John’s. This unique 2,400-acre master-planned development consists of residential neighbourhoods, light industrial/mixed use office space and retail areas. 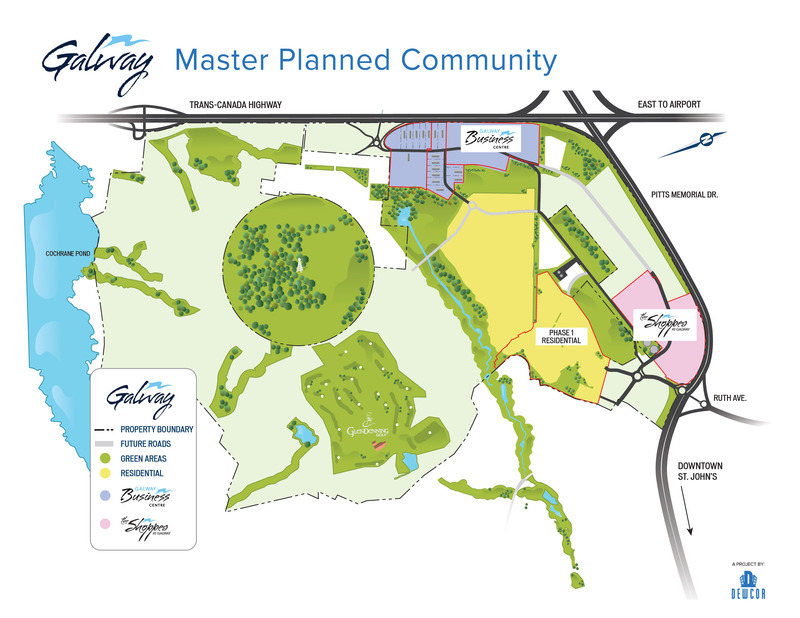 A community unlike any other in the province, Galway promises an abundance of green space where beautifully designed homes will be just the tip of the iceberg. Extensive walking trails, parks and playgrounds will be nestled amongst stores, pubs and coffee shops – all designed to make this a truly special place for residents. Galway was named in honour of Danny Williams’ mother Teresita Galway Williams, and reflects the strong cultural connection Newfoundlanders and Labradorians have to our ancestral roots. This new community is both the continuation of a family legacy, and the beginning of a new one. Galway is a DewCor project and is the first of its kind in Newfoundland and Labrador.